TobyMac's Christmas CD Light of Christmas released earlier this month; and in honor of that new release, TobyMac is doing an awesome Christmas giveaway! 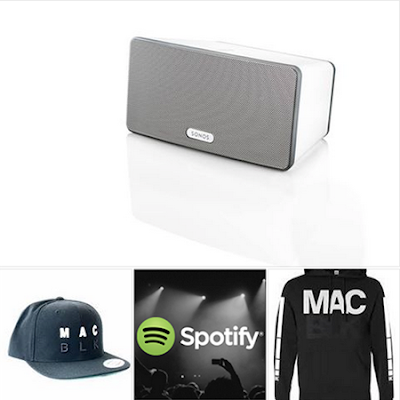 How would you like to win a Sonos Play 3 wireless speaker, along with some TobyMac gear and a $30 Spotify giftcard? (See photo of prizes below.) Go here to enter the giveaway. There are many ways to enter including watching his "Light Shine Bright" music video, following him on social media, and more, so you can put in lots of points! The giveaway ends in mid-December, so hurry and enter!